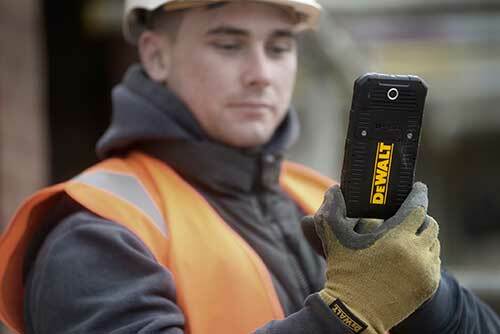 DeWalt partnered with Global Mobile Communications to create the DeWalt MD501 smartphone. There is currently no word on pricing or a release date. This phone is designed for use on rugged job sites. The phone’s IP68 certification means it should be capable of being submerged underwater for up to 30 minutes in up to 2 meters of water and be fine. Additionally, its huge battery should last all day or longer, and it’s designed to withstand extreme temperature changes and ground impact. Finally, users won’t have to remove work gloves to use it. On the inside, the phone carries pretty standard, run-of-the-mill hardware. Android 5.1 Lollipop is the phone’s operating system, and it’s equipped with a 13-megapixel rear camera and a 5-megapixel front camera. It features a dual SIM feature, which allows users to keep personal and business mobile accounts separate, run separate contracts for calls and data and protect themselves from poor network reception with a Roaming SIM back-up. High-tech isn’t really this phone’s calling card, but DeWalt is delivering a highly durable option for those working in rugged conditions.